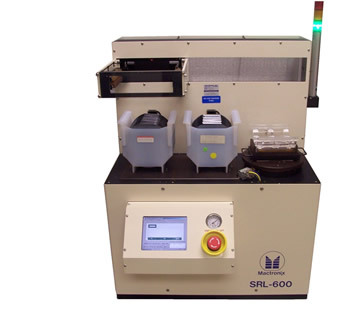 Horizon Senior/Junior 3-stage Wafer Transfer Machine transfers 25/50 wafers from Plastic to Quartz, Plastic to Plastic and Quartz to Plastic. PLC computer controlled enhancing system performance and service. Error free operation with logic software, allowing the machine to determine correct transfer to avoid accidental misprocessing. Visual graphics as well as a touch panel display allows not only operator interface, but also easy maintenance and service. Brushless motors, clean room grade bearing, linear head movement and hard black anodized frame limit particle contamination. Ergonomic design, as well as adjustable active matrix color display to meet semi standards for operators height requirements. Color keyed real time graphics to quickly inform operator system status. Electric reflective sensors are used to detect wafer presence in both retainers and carriers to prevent accidental double loading and scratches. Retainers and head assembly default to fixed position to prevent dropping wafers in the event of electrostatic discharge, loss of power, RFI or loss of air pressure. When system reboots any remaining wafers will be returned to a home position to prevent operator from manually unloading system.